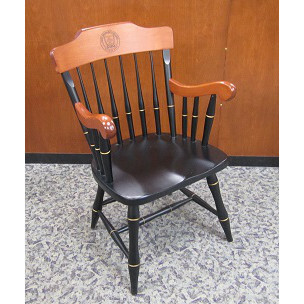 BLACK: Black chair with cherry arms and back, with laser engraved seal. CHERRY: All Cherry chair with a laser engraved seal. Each chair is made of select Northern hardwood. Assembled by expert craftsmen, these chairs will endure for generations. All chairs are drop shipped from the manufacturer and take 4 to 6 weeks to deliver. Additional $35.00 shipping charge which is included in the price. Other items purchased will incur additional shipping costs. Additionally, options for personalization are available by phone, please call 1-(866)-213-0727, toll free. 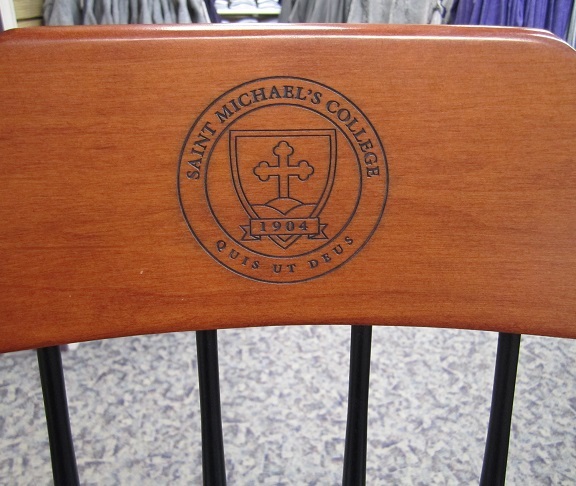 Text may be added below the seal in the form of a laser engraving or a brass plaque for $25 dollars. Additional lines of text may be added past the first for $10 each, to a maximum of three lines. Each chair is custom made for our customers. Because of this, we are sorry to say the chairs are not returnable.